The day after Christmas (but who's keeping track? ), I was making the rounds and visiting all of my favorite food blogs (there are many! )...when lo and behold, I was THRILLED to learn that Barbara (of Barbara Bakes) was passing a blog award on to me! This is my second award, but it is as exciting as the first, especially coming from Barbara! Her blog is amazing, and so is she! I love blogging! It is so fun and affords me the opportunity to "meet" such wonderful people! Mahalo Barbara!!! I enjoy these 3 blogs so much! Such talented, genuine people! :) You are all so deserving! Sue! Oh my goodness I'm so excited! Thank you, thank you! I've been missing your posts, and now I know why - Hawaii! (the temp has been in the teens here,so I'm a little jelous!) I have really enjoyed "meeting" people through the blogging world too, and many whom I've met have been through your Munchkin Munchies site. Thanks again, can't wait to display the award! THANK YOU!!! I love it! I love your site too! 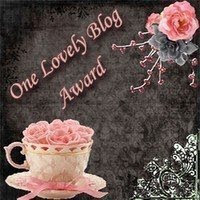 These blog awards are the sweetest and truly are appreciated. You write on your blog wondering if there is anybody out there..so to know that people like it really means so much! Congratulations on getting the award :D. i love blogging too. and you are the wonderful people i "meet". Ahhhh! How sweet! Thanks! Hawaii sounds like the perfect place to spend time in January. Mahalo! Congrats on your award! And I hope you had a fabulous time in Hawaii!! Congrats on the award!! Sounds like you had a wonderful time.